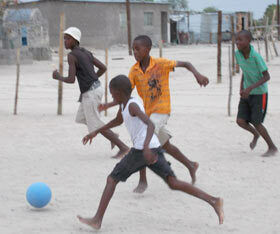 When many of he boys didn't want to join in the dance classes in the Oneshila settlement Sisi organised football. The boys play twice a week and participate in school tournaments sometimes winning them. 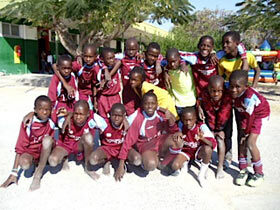 They have team uniforms which were donated by Arbroath Football Lads Club. They have no football pitch, nor goal posts, playing on rough stony ground in their bare feet, and using broken stones to mark out the goals. We had a challenge in finding footballs that didn’t burst after half an hour of play however have now sourced futbols, from a charity called One World, which are made for just such conditions and are lasting beautifully. As a team activity, football teaches great team skills, as well as physical skills, not to mention fitness, team discipline and a sense of belonging. We are keen to raise funds for a team coach who will also have a focus on raising HIV awareness and appropriate behaviour.